When the rental car agent says, “We are all here for the golf and wine,” where are you? 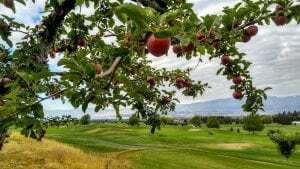 If not heaven, then perhaps you have arrived in Kelowna, British Columbia. 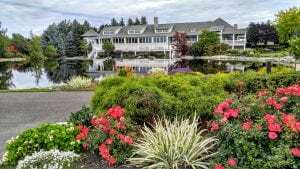 Forget the somewhat ordinary façade when you arrive at The Manteo Waterfront Resort. Inside awaits a comfy suite or villa with spectacular views of the marina and beyond on Lake Okanagan, which floats anyone’s boat, over 100 miles long. Smack Dab is their water view restaurant, in the middle of business and pleasure, a combo of casual and fine dining experience with excellent food and wine pairings. 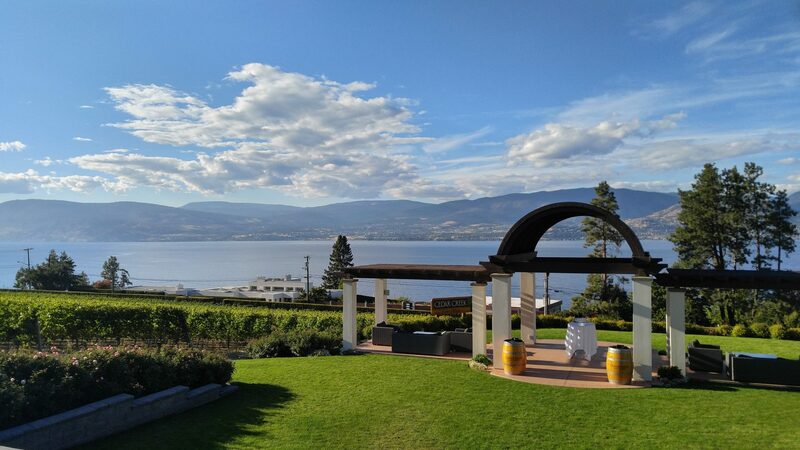 This is after all the Okanagan Valley, which has evolved from a “Peaches and Beaches” spot to a world famous wine region and four season destination. Kelowna is like a box of chocolates. You never know who you will get paired with on the course. At Harvest Golf Club we loved our round with Mike who emigrated from Croatia 50 years ago. Views of the Okanagan Lake are inspiring on this open design by Graham Cooke. Japanese owner of Nippon Cable Co. (cables for chair lifts) who also owns 25% of Whistler Blackcomb, built the Harvest Golf Club to honor his father, hence the Japanese Gardens that seem like an extension of Butchart Gardens in Victoria. The spectacular setting is perfect for 50 weddings a year including that of Golf Director Bruce’s daughter last month. 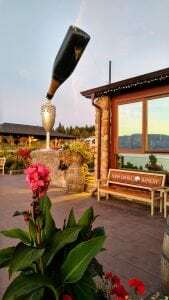 Definitely enjoy the 19th – The Harvest Grill Restaurant overlooking a pond with falls, flowers, orchards beyond, and yes Okanagan Lake. Go for the Prime Rib Dip with Caesar Salad. at Tantalus alongside her GM and winemaker hubby David. Two young lucky international winemakers join them every year. Tantalus will bring in 100 tons of grapes with a focus on sustainability and no sprays. Noisemakers mimic canons, birds of prey and distressed birdcalls to dissuade hungry peckers. In this fruit basket of the valley, 20-50 beehives naturally produce a bonus crop of healthy honey. We walked among the vines, testing the sweet purple pinot noir “berries.” The seeds were soft enough to digest but the grapes needed a few more days on the vine for David’s liking because the seeds still had a little gel around them. The Riesling skin gets translucent when ready for hand picking. The flavor is right beneath the skin. Some winemakers may include the skins but David believes the skin contact makes the wine more textural but less pure. Tantalus constructed the first building to receive the LEED certification. They say it is really a big frig in a most efficient way. Easy to control temperature is the key to making wine. never would have chosen if not for the high recommendation. The founder and proprietor Steven Cipes discovered that old world wineries had arches for sacred geometry and believed that the pyramid being the most clarifying of geometric shapes would enhance the wine. He tested storage in a cellar in a pyramid and out. Now all Summerhill wines made from organically, biodynamically grown grapes spend time within the pyramid. It’s pure wine poetry. Every wine tour delivers new viticulture lessons. Vines have thrived in the Okanagan Valley since the turn of the century, the tasting rooms since the 80s. 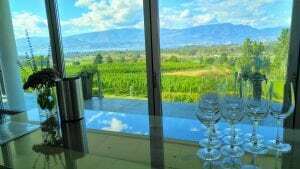 Imagine that there are over 150 wineries now in Kelowna – so much wine and so little time.